Close/r is a rather interesting project by Jon Attwood, perhaps known more as Yellow6. A first, unknowledgeable listen to this album will raise many questions that Attwood is kind enough to answer clearly in a short explanation within the album’s booklet. The essence of this project lies in three guitar chords that are repeated endlessly in a specific 7 parts sequence. This loop, ending only after 70 minutes had passed, is escorted by three groups of artists, making it twist, bend and gain new meanings as each track passes. 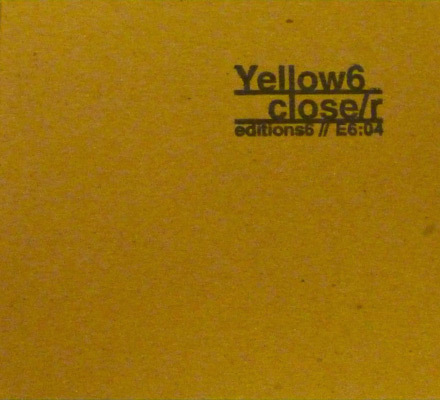 With Attwood as Yellow6, play also – Fraser Macgowan, David Newlyn, Absent without Leave, Konntinent, Kevin Hufnagel, Stafraenn Hakon, Ringinglow, Winterlight, Northern Valentine and Arconic. The guitar loop itself, ethereal and drifting, stays minimal throughout the entire album. This doesn’t prevent it from being loaded with emotion that only grows with its consistency. The manner in which the different people who take part in this project play their music with Yellow6 varies, of course, and after a while of listening to the soft, delicate loop again and again, one might forget about Attwood’s chords and dive in the different sounds of the participating members instead. The result is beautiful and very touching and channeling its way between experimental music and post rockish, meditative encounters. The albums greatest power is in the fact that while you might think that this idea can be easily executed in a very bland and boring way, the participants of this project prove beyond doubt that they can create a fascinating creation our of a simple, rigid and strict skeleton. Close/r welds itself into one long track of ongoing meditation and wonder, promising itself a place among the finer creations of Yellow6.